Their tall, thin 100ml jars are like jam-jar cocktails. Totally addictive. They do pottery too. Check out the website. 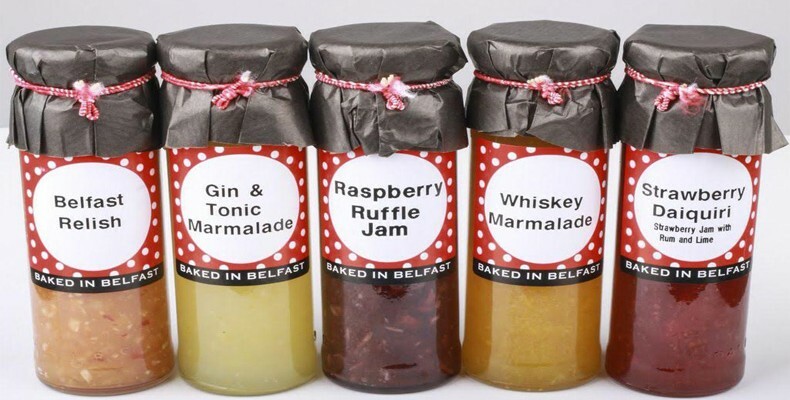 Gin and Tonic Marmalade, Vodka and Orange Marmalade, Strawberry Daiquiri Jam, Mojito Marmalade, Raspberry Apple & Lime Jam, Apple & Cinnamon Jam, Cinnamon Marmalade and Belfast Relish, Guinness & Garlic Chutney, Whiskey Marmalade, Raspberry Vodka Jam, Raspberry Ripple Marmalade, Pina Colada Marmalade, Blueberry & Ginger Jam, Pernod & Blackcurrant Jam, Red Hot Tomato Chutney and Strawberry & Kiwi Jam, Blueberry Smash Jam and Cosmopolitan Marmalade.